Amid significant business reorganization and tremendous pressure to develop new drugs, a global pharmacy company needed to inspire, encourage, and focus teams. We created experiences within the workspace that gave new meaning to employee work and cultivated a culture of innovation. Workplace as communication tool. 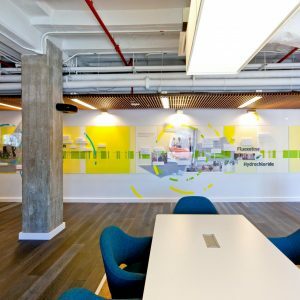 We blended architectural space, technology, and story to use workspaces as a brand and communications canvas that inspired culture change and focused newly formed business units on their mission. Business unit identity branding. Unique branding for four reorganized business units characterized their separate workspaces and built each unit’s identity. People-centered messaging. We created large-scale environmental infographics about new products, interactive digital wayfinding, and museum-style displays showcasing historical innovations. This message shifted the culture from a focus just on creating products to a focus on creating a better quality of life for the people who would use them. Visual storytelling. Patient stories, paired with compelling statistics, were creatively integrated into workspaces, personalizing each business unit’s mission and emphasizing the impact of employees for individuals across the globe.